It’s easy to think about Odaiba as a summer spot, with its sprawling manmade beach and seaside activities. 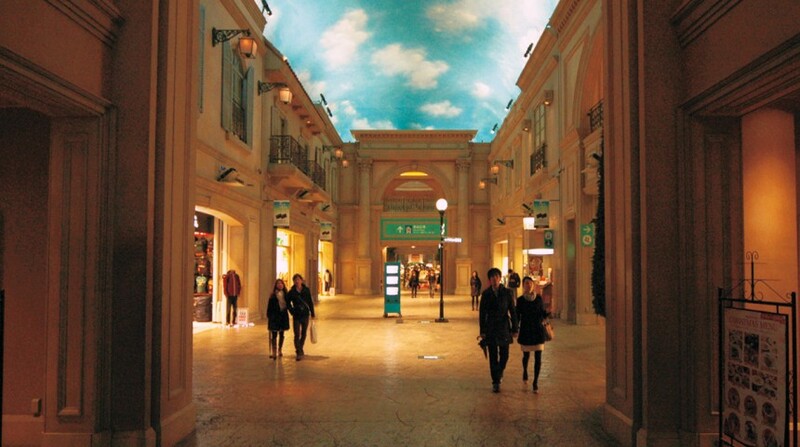 But unlike other islands, Odaiba is a dynamic adventure land built to weather any season—even the coldest. The artificial island was built during the late Edo Period as a defense fortress, partially developed during the boom and bust of the early 1990s, and then left virtually deserted until its resurrection almost a decade later. Set sail with Metropolis and explore some of the best that the island has to offer. While not quite an attraction—and only partially in Odaiba—this quick and easy rapid transit monorail is worth a mention. Depending on the time of day, you might need to fight for a spot with good window access. 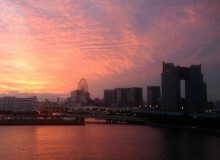 But the views are worth it as you speed above street level, meandering around Tokyo’s skyscrapers, before crossing the Rainbow Bridge and onto the island. For the best views, try sitting in the front car, which provides 180-degree views. As the name suggests, Palette Town has a little something for everyone, with a sprawling assortment of shopping and entertainment options that will leave a smile on anyone’s face. Among the different amusements is the family-friendly Tokyo Leisureland (free entry) with a large collection of arcade and carnival-style games, including an array of oddly-themed simulated attractions with names like Ninja Castle and Spirituality World. Outside the center, you can cozy up on the Giant Sky Wheel, a 115-meter-high Ferris wheel with incredible views of Tokyo Harbor. Palette Town also has abundant shopping at the well-presented Venus Fort, which includes an impressively bizarre 18th-century Europe-themed mall. Here, you can stroll along the ambient-lit Rue du Soleil or Via della Bellezza before taking a break at the Fountain Plaza, which bubbles away under a fake skylit dome. A short walk from Palette Town, Decks is another mall packed full of shopping and entertaining oddities, including a number of indoor theme parks, a Madame Tussauds wax museum, and The Odaiba Takoyaki (“fried octopus balls”) Museum. The undisputed highlight, however, is the lurid nostalgia bazaar, Daiba-itchome Shotengai. Here, you can meander through the different decades of Japan’s Shōwa Period (1926-1989), with a variety of attractions and stores selling all sorts of knick-knacks. The bazaar also holds a dizzying collection of retro arcade games, the most modern of which include Sega’s timeless shoot-‘em-ups The House of the Dead and Virtua Cop 2. 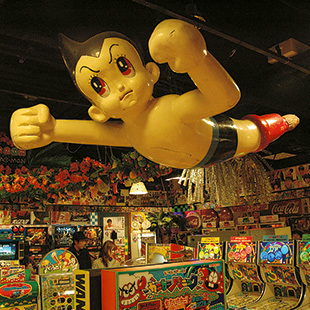 The arcade is watched over by a life-sized replica of Mighty Atom (aka Astro Boy), which hangs from the ceiling. 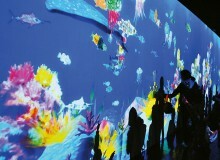 No trip to Odaiba is complete without a visit to the Miraikan (National Museum of Emerging Science and Innovation). 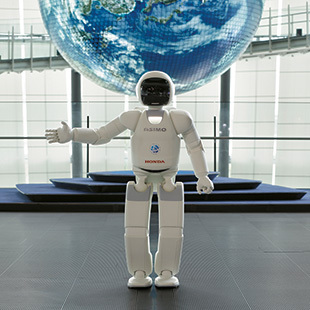 If Odaiba is the quintessential land of tomorrow, then the Miraikan is its heart, with a large exhibition of the latest trends in science and technology. The museum is also replete with futuristic gizmos and incredible breakthroughs, as well as a comfortable theater and planetarium. audience and returning to his home. Further on in the museum, you can also meet Otonaroid, the uncannily lifelike teleoperated android who answers any queries you might have about her or the museum (in Japanese and English).